It’s almost here! Intimate Impressionism from the National Gallery of Art opens tomorrow in the Seattle Art Museum special exhibition galleries, and we’ve got an array of opening day activities in store for you. Because we’ve got a robust day of art planned, read on for the complete breakdown of ticket prices, events, hours, and more. As tomorrow is First Thursday art walk, the museum will be open late until 9 pm to accommodate your art-loving schedule. As this exhibition will be popular, tickets for Intimate Impressionism are timed, so when purchasing online or in person, select a specific day/time in which you’ll plan to visit the exhibition. 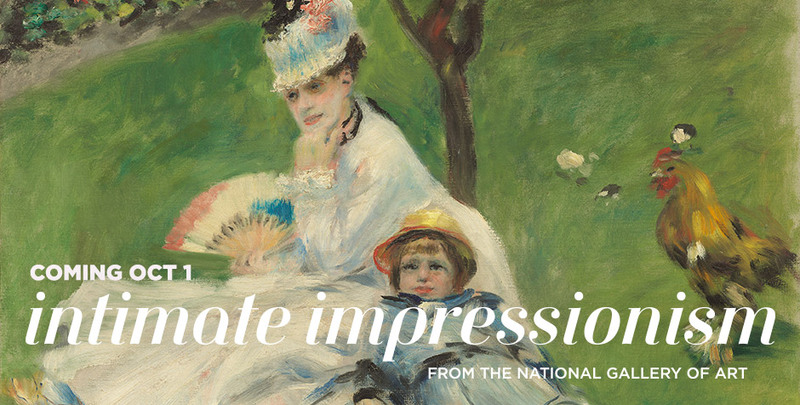 Ticket prices for Intimate Impressionism from the National Gallery of Art are listed below. ​This ticket includes access to all collections and installations. Save up to $5 per ticket when you purchase your tickets in advance online! This is a limited time offer. Visitors purchasing tickets onsite will not be eligible for the discount. This online discount not valid on the First Thursday of the month, or for seniors on First Friday. Experience an overview of the new exhibition Intimate Impressionism from the National Gallery of Art with Chiyo Ishikawa, Curator of European Painting and Sculpture, followed by a live performance from Seattle Metropolitan Chamber Orchestra’s String Quartet featuring works by Impressionist composers. The SMCO String Quartet is composed of members of the Seattle Metropolitan Chamber Orchestra, an innovative ensemble that brings unique musical experiences to the ears of young and diverse listeners. My Favorite Things tours bring some of the most opinionated and fascinating artists, cultural producers, and community figures into the galleries to discuss their favorite works of art. This tour will be led by Mary Anne Carter, a Seattle-based visual artist and curator of the Fashion Hot Dog 225 art space. Humor, wildness, and structure define both Carter’s character and body of work, which includes printmaking, fashion design, textile design, and performance. Tour starts at 6:30 pm sharp. Don’t miss it! Non-flash photography will be allowed in the galleries, so feel free to take a selfie next to your favorite painting, with your best friend, or with your Impressionist doppleganger while experiencing Intimate Impressionism! Be sure to tag your photos with #SAMImpressionism. We’ll see you tomorrow for an extraordinary night of art with Monet, Renoir, Manet, Cézanne, Degas, Van Gogh, among other Masters! Madame Monet and Her Son (detail), 1874, Auguste Renoir, French, 1841–1919, oil on canvas, 19 13/16 x 26 3/4 in., National Gallery of Art, Washington, Ailsa M​ellon Bruce Collection, 1970.17.60.